Arthur: Ford, you’re turning into a penguin, stop it. Trillian: [...] Please relax, you are perfectly safe. 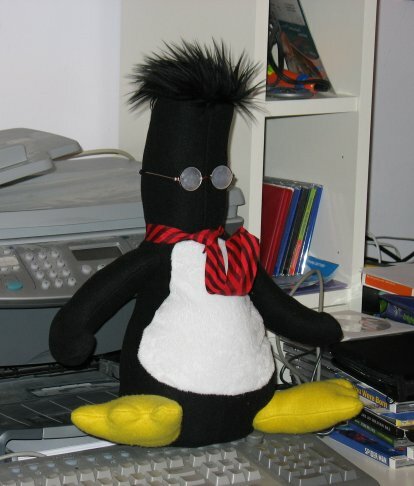 A Dilbert-styled version of the Linux penguin “Tux”. More (and larger) pictures can be found here. The toy was modified slightly from the original pattern (at http://www.free-penguin.org). 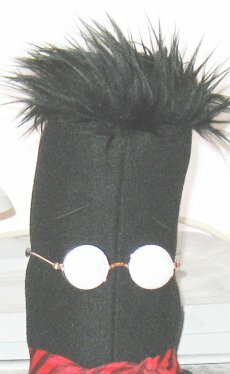 The beak was eliminated (since Dilbert doesn’t have a mouth) and the top of the head was altered to a flat-topped cylinder from the usual rounded shape. The glasses were bought from a craft-supply store and were nominally for an 18" doll -- though I can’t imagine how that could be standardized in any way, considering the variety of doll shapes and styles. They happened to fit this toy perfectly and stay on just by slightly compressing the toy. I frosted the lenses with cheap opalescent nail polish from a local dollar store, matching the appearance of glasses in the world of Dilbert. The necktie is shaped from inside by a plastic-coated wire -- actually, the wire closure from a package of cookies. The toy has eyes, though they’re hidden behind the glasses; I used small black-enamelled clothing snap fasteners to give the comic-character “black dot” look. See also: Txulhu, Centauri Emperor Penguin, Bert Worcester, Pi Cop, Broomball Wizard, Open Source B**b Project, Barrayaran Emperor Penguin. jpolowinXYZZY@sympatico.ca but remove the XYZZY - it’s a little magic to baffle the spambots.